The term salsa refers to a variety of Latin dances with origins in Cuba and Puerto Rico, with regional differences both here and in the Latin American region creating a host of different salsa “flavors.” The mambo, rumba, and cha-cha contributed much of the dance’s basic steps, but the word “salsa” itself is relatively recent, having been coined by an American record company that specialized in that particular style of music. Forget about health care reform. Want to hear a really fiery debate? 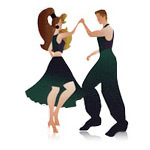 Try asking Latin dance experts about the history of salsa and how developed, and you’ll hear as many theories as there are experts in your sample. What is universally accepted, however, is that contemporary salsa evolved as the offspring from a number of different Latin dances, from the mambo to the rumba to the cha-cha. Much of salsa’s origins can be traced back to the creation of the rumba and mambo in Cuba in the 1930s and 1940s. Those dances, of course, grew out of the African slave communities in Cuba, whose ancestors brought their rhythmic instruments and dance moves to the New World in the 16th century. Cuban and Puerto Rican musicians and singers made their way to the American mainland in the 20th century interwar years and forged indelible alliances with the thriving African-American jazz community. Soon, renowned Latin musicians such as Desi Arnaz, Carmen Miranda, Celia Cruz, and Tito Puente had popularized Latin music and dance and brought them into mainstream America. Salsa came into full flower in New York in the 1960s, after Fania Records, an independent label that produced some of the most innovative music of the period. Fania needed a catchy term to attach to its artists’ unique fusion of Latin, Spanish, and African rhythms and styles, and the salsa craze was born. Although exceptions occur, salsa music is generally written with four beats per measure, and a full salsa dance step is performed in two measures of eight beats, with the first measure for the left foot and the second measure for the right foot. Typically, the leader (usually the man) and follower (usually the woman) start in the Closed Position. Here, the two dancers face each other, with the leader holding the follower’s right hand with his left. His right-hand rests on the follower’s back, while the follower places her left hand on the leader’s shoulder. Close eye contact is maintained. 3As with many other dances, much of the movement in salsa dance comes from the hips, legs, and feet. Keep your steps loose and fluid, and pay attention to the beat of the music. Start with your feet in a closed position (side by side). Step on the beat with your right foot, while still keeping the closed position. Step forward with your left foot, rocking slightly, your right knee bent. Step on the beat with your right foot. Step your left foot back into closed position. Step on the beat with your left foot. Step backward with your right foot, rocking slightly, your left knee bent.